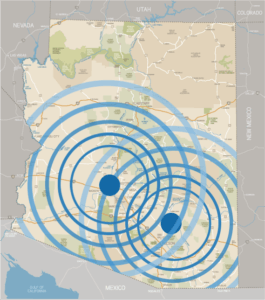 Our facility is conveniently located in the Tucson area, making it easy and quick to get to and from your business, as well as your customers and vendors. Located at 3770 S Broadmont Drive, our large corporate office is just one block west of Palo Verde off Ajo. Our brand new 15,000 square foot warehouse is close to Interstate 10 & the Tucson Airport easily accommodating the growing number of customers’ storage, warehousing, distribution, and logistics needs in the Tucson and Arizona area. Our facilities are secure and gated under a 24 hour police alarm coverage, so you can trust that your assets are protected around the clock. Our full sector, multi-industry services in warehousing and distribution offers much more than the competition, including inventory storage by rack or open square-foot. Our warehouse is open Monday – Friday from 7:00am to 7:00pm.